A slightly anxious Jill Palmer preparing to read the lesson at the ‘Service of Reflection’ on Good Friday at the Parish Church of Windsor in front of some 350 people. Jill, arranger at the local branch of Lodge Brothers, comments that, “As a lay person, being invited to do this is a privilege and for me a personal journey each time I take part. I find doing any presentation a huge ordeal and I do suffer with anxiety, especially when being in a position which is public. Yet the Easter message is all about transforming and enlightenment, and the performance of the ‘Reflection’ affects me personally. For a brief time I am transformed to be able to do something that I would normally find very difficult”. 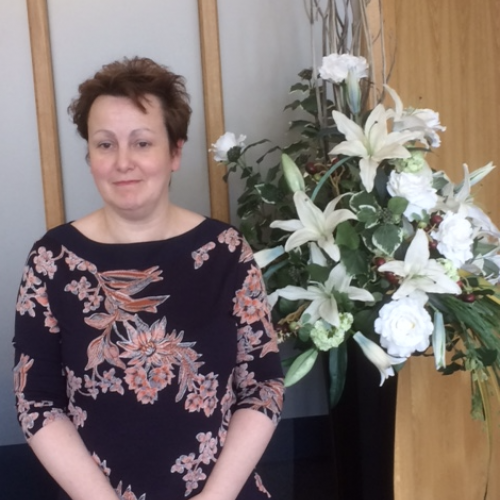 Jill lives in the town and believes that, “being part of a community is essential to be able to offer support to the bereaved, and these experiences allow me to leave the office environment and contribute to an important service in the local church in Windsor”.